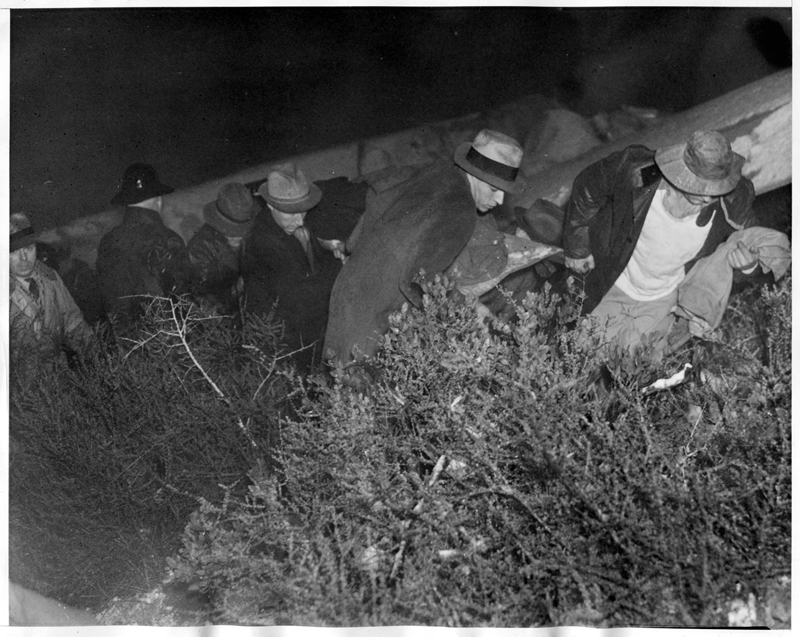 January 13, 1937 — Rescuers recover the body of James A. Braden, one of five people (early reports said two) to die in the crash of a Boeing 247D the previous day on Iron Mountain near the Santa Clara Divide south of Newhall. Above is the scene near Newhall, Calif., as rescue workers removed the body of James A. Braden, of Cleveland, O., Jan. 13th, from the wreckage of the plane that crashed Jan. 12th, with the loss of two lives and the serious injuries of five others. Martin Johnson was the other fatality. His wife was so seriously injured herself that she has not been told of Mr. Johnson's death. LW2431a: 9600 dpi jpeg from original print purchased 2013 by Leon Worden.